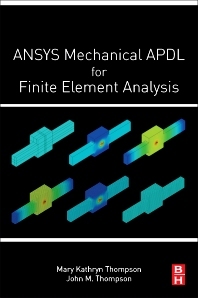 ANSYS Mechanical APDL for Finite Element Analysis provides a hands-on introduction to engineering analysis using one of the most powerful commercial general purposes finite element programs on the market. Students will find a practical and integrated approach that combines finite element theory with best practices for developing, verifying, validating and interpreting the results of finite element models, while engineering professionals will appreciate the deep insight presented on the program’s structure and behavior. Additional topics covered include an introduction to commands, input files, batch processing, and other advanced features in ANSYS. The book is written in a lecture/lab style, and each topic is supported by examples, exercises and suggestions for additional readings in the program documentation. Exercises gradually increase in difficulty and complexity, helping readers quickly gain confidence to independently use the program. This provides a solid foundation on which to build, preparing readers to become power users who can take advantage of everything the program has to offer. Kate is a Mechanical Engineer with almost 20 years of experience using ANSYS for engineering design and analysis in academia and industry. Kate specializes in finite element modeling of microscale surface phenomena, parametric design, new product development, design for manufacturing, engineering design theory and methodology, and engineering design education and assessment. She has taught ANSYS and finite element analysis at the Massachusetts Institute of Technology (MIT) and has held faculty positions at the Korea Advanced Institute of Science and Technology (KAIST) and the Technical University of Denmark (DTU). Kate is currently engaged in material and process research and development at GE Additive. She earned her SB, SM, and PhD in Mechanical Engineering from the Massachusetts Institute of Technology. John is a Mechanical Engineer with almost 50 years of experience using the finite element method for engineering analysis. From 1967 to 1971, he worked with special purpose finite element programs at the Westinghouse Electric Corporation. He switched to general purpose finite element programs with the initial release of ANSYS in 1971. John served as a consultant to the ANSYS Headquarters Technical Support Group for 20 years where he specialized in nonlinear material models, APDL, User Programmable Features, specialty applications, and other non-standard uses and customizations of the program. He has used ANSYS as a consulting engineer to support Fortune 500 companies and has taught ANSYS and finite element analysis at the Massachusetts Institute of Technology (MIT) and the Korea Advanced Institute of Technology (KAIST). John is currently a Professor of Industrial and Engineering Technology and a registered Professional Engineer in the Commonwealth of Pennsylvania. He earned his B.S.M.E., M.S.M.E., and Ph.D. in Mechanical Engineering from the University of Pittsburgh.